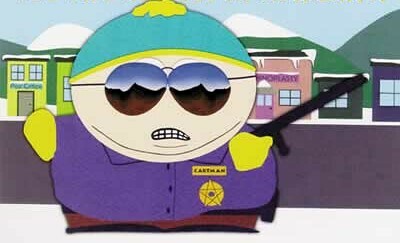 When did Cartman become a New Mexico cop? YOU MUST RESPECT MY AUTHORITEH!!! It’s funny when it’s just a kid in a cartoon. It isn’t when it’s a supposedly grown man armed with a badge and a gun. Here’s the story. A female in a van full of kids who clearly is not compliant with an officer on a traffic stop for going 71 in a 55mph zone. OK, most if not all of us have done that, but for that, she should be subject to penalties of law. But that’s where it all goes wrong. Here’s the dash cam video of the incident shown in a news report. Bottom line… she did wrong. She didn’t just speed, she also evaded arrest. What she did NOT do was endanger lives… for that we can thank the police, who crashed the windows and then fired on a minivan they knew carried five children, the youngest 5 years old. What possessed you to think the BEST option was shooting at a van full of children because their mom evaded a traffic ticket? Is there just a little bit of a chance your reaction was disproportionate to the problem? Did it occur to you a minivan with a huge full luggage rack probably wasnt going to blend in and disappear? If many municipalities disallow high speed chases in such cases… does firing wildly in public thoroughfare sound a lot safer? Did you consider we don’t give the death penalty for evading arrest at a traffic stop, much less being in the car with someone that tries? Is the entire concept of “appropriate force” foreign to you? Is there maybe a chance your out of control rage had more to do with someone failing to respect YOUR authority than the fact they broke a law? Oh. One more question. WHAT THE HELL WERE YOU THINKING? There is no chance what appears on that clip is an appropriate response by law officers. Yes, cops have dangerous jobs. Yes, they should be paid more than rock stars and guys who read movie scripts. So should nurses and school teachers… but that’s another post. You took the job. You have to abide by the rules. Bottom line you take on an awesome responsibility when you are issued a badge and a gun. We the public do not ASK, we REQUIRE that those carrying that authority be the adult in the discussion, not tyrannical obnoxious reckless trigger-happy maniacs. If that’s an issue, no problem, just turn in the badge and the gun. You’re too stupid to carry either. When I look around I see liberty dying. The federal government no longer considers itself our servant and has turned on us, wanting to control our lives. Now the same authoritarian thinking seems to be filtering down to law enforcement. We were told by the Founders that a nation of sheep would beget a government of wolves, and we certainly see that coming to pass. I believe the only thing that will turn that around is for us to develop a spine and demand a return to what is right and proper. The same action must be taken by us when law enforcement behaves wrongly. We’ve now seen multiple incidents from New Mexico cops where the civil rights of multiple individuals have been violated and innocents have placed in harm’s way by those who are tasked with upholding the law. The remedy, to this simple country boy, is obvious. When cops go rogue, they need to be slapped down with penalties both criminal and civil, in a very public fashion. Word will get around.